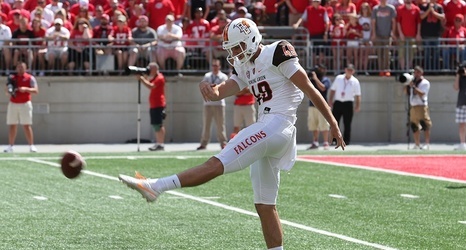 BOWLING GREEN, Ohio – The College Football America Yearbook has named its 2017 Mid-Major Starting Lineup, the publication's version of the All-American team, and Bowling Green State University punter Joe Davidson earned a spot on the list. Davidson is one of six players from the Mid-American Conference on the 27-member squad. The Mid-Major Starting Lineup consists of players from the Group of Five conferences, as well as independents Army, BYU and Massachusetts. In 2017, a total of 21 schools are represented in the lineup, including five from the MAC. Davidson put together one of the best punting campaigns in the Football Bowl Subdivision (FBS) during the 2016 season.